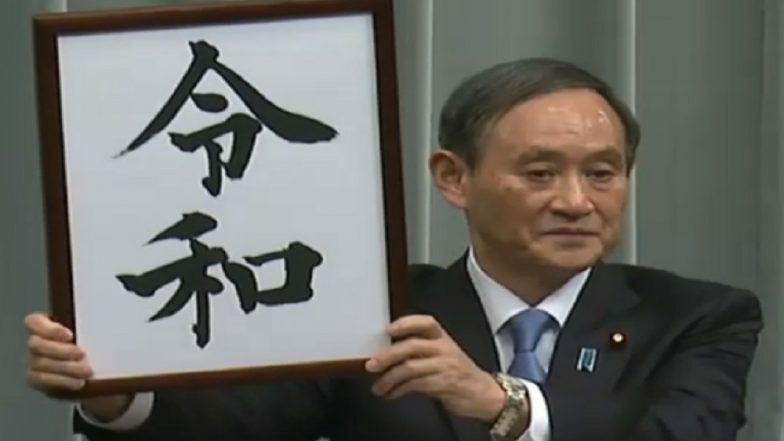 Toronto, April 2: To mark the start of a new era in Japan’s history as Crown Prince Naruhito is set to ascend the throne, Japan’s Chief Cabinet Secretary Yoshihide Suga announced on Monday that the new Imperial era will be named "Reiwa". In modern times, each imperial era in Japan corresponds to the length of an emperor’s reign and Reiwa will mark Prince Naruhito’s ascension to the Chrysanthemum Throne on May 1 following the abdication of his father, Emperor Akihito, on April 30. The Chief Cabinet Secretary explained the name ‘Rei wa’ was derived from the introduction to a set of poems from “Manyoshu,” the oldest existing compilation of Japanese poetry. The first character represents “good fortune,” while the second “peace” or “harmony.” Each Japanese emperor's reign is given a name that is then used alongside the Western Gregorian calendar to mark the years in Japan. The start of the Reiwa Era will mark the end the 30-year run of the Heisei (“achieving peace”) Era, which began from January 8, 1989. The Heisei era will come to an end as Emperor Akihito announced in December 2018 that he wished to abdicate his throne due to his considerable age. He is 85 years old and health concerns left him unable to fully carry out his official duties. The monarch is the first Japanese emperor to give up the Chrysanthemum throne in the last 200 years.